Goa is one of the hottest vacation spots for vacationers. This beautiful holiday destination is known for its picturesque beauty and exotic locales. Goa is also regarded as the small emerald on Western coast of India. Goa is approximately 3,702 sq kms. 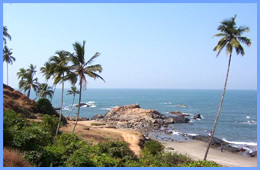 Our tour itineraries for Goa would surely add up to a memorable experience for you and your family. Goa is mainly popular for its mind-boggling beaches, temples and churches. Silvery sandy beaches of Goa are also regarded as the Coastal heavens. You would be able to spend some great moments with your beloved on sun kissed beaches. Goa is known for cosmopolitan lifestyle, fairs, festivals and fennis. Goa is one of the most popular tourist attractions of India. It incorporates some beautifully carved architecture. Rich culture and heritage are a few major highlights of Goa, India. Goa is one the ancient cities of Hindu. Several features from Portuguese role are still retained in Goa. Goa tour packages would make your tour to Goa more enjoyable and easier. For water sport enthusiast, Goa tours would be exciting. You would be able to enjoy some great water sports, such as skiing, parasailing etc. Winters are considered ideal for Goa tour. Goa beaches are ideal place for getting rid of stress and fatigue. So, what are you waiting for? Get ready for an exciting trip to Goa by choosing from our many well designed Goa tour packages. Moreover, Goa is one of the best places to explore, as it is rich of Panjim's unique architecture and colorful markets. India Profile offers online information about tour itineraries for Goa and Goa Tour Packages.